Young Messiah? Same Old Silliness!!! As is increasingly the case in the last few years, it seems Hollywood is answering the request of millions of Christians in America for more family friendly films with Christian themes. Over the last several years the movie industry has delivered an environmentalist take on the Noadic flood with a hallucinating and violent Noah; and a movie about the Exodus from Egypt that portrays Moses as a barbaric schizophrenic. Just this past February a film about the Resurrection of Jesus came out. Although this film was fairly biblical, with a few moderate to heavy moments of license, it did not gain any traction with the un-churched crowd. Now Hollywood has given us a new incarnation of Jesus life (new is not good in this case). The story is an adaptation of a novel written by Anne Rice, hoping to fill in the blanks of Jesus life as a child. It is true with “The Ten Commandments” that Hollywood license was taken. Yet it is also true that producers had access to historical records of Moses life, where the Bible had been silent. Although these are not considered to be authoritative they do corroborate some of the hole filling concerning Moses silent years. When considering the “Passion of the Christ” the script was heavily influenced by the visions of Anne Catherine Emmerich, an Augustinian nun who lived in Germany from 1774 to 1824. Although this influence can be seen fairly easily in the movie, there is only one scene outside the pale of what could have happened. Although the movie was unnecessary in it gratuitous violence it was fairly accurate. Does the movie “the Young Messiah” follow this pattern? Not on your life. The traceable events of the film, which deal with Jesus family’s return from Egypt and how they settled in Nazareth, are recorded in the Bible. Most of everything else is speculative at best and an irresponsible fabrication at worst. The film presents a Messiah contrary to the the Messiah’s own version of Himself in the Word of God and that can have disastrous ramifications. Let us consider something fairly simple which will illustrate my point. The miracles that this supposed young messiah does. Scripturally speaking, the Lord Jesus performed no miracles until after He was baptized in the Jordan river and was filled with the Holy Spirit. Afterward He was tempted, and then returned in the power of the Holy Spirit. Why was this the case? We find the answer in the O.T. scriptures. Isaiah 53:1-2 (NKJV) Who has believed our report? And to whom has the arm of the LORD been revealed? For He shall grow up before Him as a tender plant, And as a root out of dry ground. He has no form or comeliness; And when we see Him, There is no beauty that we should desire Him. Quite simply the Messiah was not to be extraordinary looking or behaving until His moment of manifestation to Israel, as this was God’s plan. Following this line of thought makes Jesus answer to Mary in John chapter 2 where she requested He do something about the wine shortage, easily understandable. In response to her inquiry He declared “Woman what does your concern have to do with Me? My hour has not yet come”. This event occurred prior to Jesus declaration of being the fulfillment of Isaiah 61:1 in Luke 4:16-30. The reason this is important is that it proves that Jesus was a normal looking Jewish man, with no resume that would arouse suspicion. The only reason He did the miracle is reported in John 2:11… “This beginning of signs Jesus did in Cana of Galilee, and He manifested His glory; and His disciples believed”. Jesus was led to perform this miracle to reveal Himself as the Messiah they thought He was (see John 1:49). The only people who would have known of this miracle were the disciples, not even Mary was privy to the results. Which brings us to the other people who knew Jesus true identity as a child; His mother and step-father, a faithful old man named Simeon, and Anna the prophetess (Luke 2:25-36). The scriptures do tell us what happened in His silent years as recorded in Luke’s Gospel. From Jesus presentation at the Temple in Jerusalem, until twelve years of age, nothing extraordinary happened outside of His return to Nazareth that we know of. From the age of twelve until His baptism by John, the above scriptures must suffice. This raises another important issue. If as a child Jesus did such extraordinary miracles, would not His brothers have known? The answer is absolutely. As the movie establishes raising someone from the dead or healing them is not easily hidden. In spite of this rational, his own brothers, whom He grew up among did not believe He was whom the people said He was (John 7:1-5). The above scriptural truths are historically corroborated. Jesus birth, life, death, and resurrection are biblical prophetic fact, Jewish cultural and religious fact and secular historical fact. That the balance of “The Young Messiah” details are dreamed up and then hung on a few biblical suppositions is troubling at best. At worst we must ask… are they preaching another Jesus? “Plugged In” ( a “Focus on the Family” affiliated ministry) gives a gentle attempt to answer that question. “In an utterly speculative story, there’s actually little that directly contradicts Scripture’s testimony about the Christ. Much of it, in fact, confirms the solid theological tenet that Jesus was and is the Son of God, born of a virgin, and destined to save all of mankind”. As much as I have appreciated “Plugged In” over the years and look forward to their ministry of wading into the darkness to warn believers, they could not be further off. 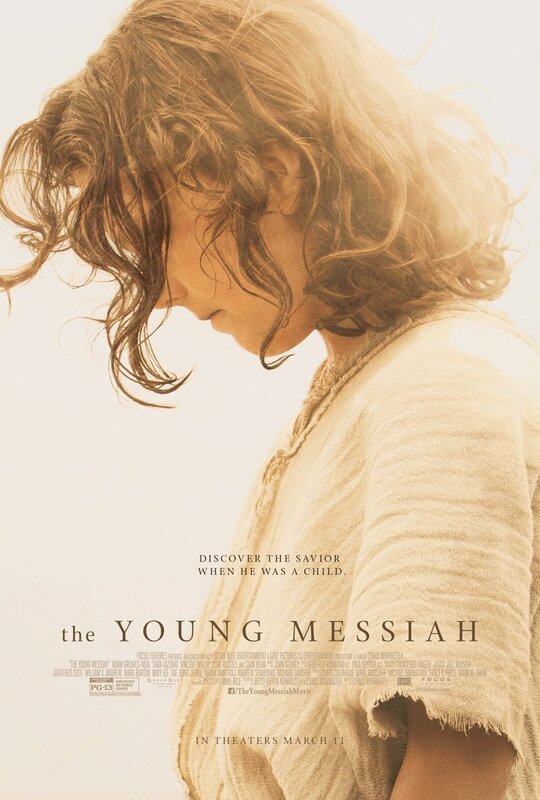 Most of what is in “the Young Messiah” contradicts the scripture, because it is utterly speculative. Paul warns about preaching another gospel in the book of Galatians. The word of God warn us about adding to or subtracting from the scriptures. I suggest we be careful of attempting to fill in the silent spaces of Bible testimony, to please our own lusty minds or desire to feed our flesh with good clean fun that has a biblical feel. This is why the article is called “Young Messiah? Same old silliness!! !” It is the same old silliness that makes an opportunity for a film such as this one, or the other disasters mentioned at the top. What is this silliness? Christians who want to be entertained. Lets face facts, if there was no market for these films, there would be no wasted funds to make them. Over the last 2 decades American Christians have croaked about not having anything to watch on T.V. and in movies. The results are dangerous even in some of the so called “Christian” made films. If we think the younger generation, who are barely able to recite key components of the Gospel, are going to be able to discern the real Jesus among all the plot developments and CGI, we are sorely mistaken. The time has come for us to manifest our Messiah in our mortal flesh, in such a way that the real supernatural presence of Christ, would bring the lost world to awe over God. In their world of technology and computer animated one-ups-man-ship, it will take God’s Almighty power to open their eyes (II Corinthians 4:1-6). This will mean genuine preaching in the power of the Spirit of God in our neighborhoods and communities, and miracles that display the truth of the message preached; but most importantly people in whom Christ, as Lord,is truly living in and through. Maybe if God’s supernatural working was more in our real time present, we would see the world’s attempts to fleece us through entertainment for what they are… the same old silliness. This entry was posted in Bible, Christian entertainment, Christian movie review, Christian movies, Hollywood, Jesus Christ, the young messiah. Bookmark the permalink. 2 Responses to Young Messiah? Same Old Silliness!!! We so fool ourselves trying to compete with the world with the biblical based movies that are made and viewed. Do we watch these movies for evangelism or to entertain ourselves, thinking that we are practicing holiness by going to a “Christian” movie. Christians need to wake up an see what is really going on,”Matt.7:15. We need to stop being obsessed with the hidden information of scripture but instead saturate ourselves to hide in our heart, the truth of the gospel. Thanks my brother for speaking truth. Wow as i read this i was mourning. So many people who will see this movie may possibly believe it and as you said above. Paul warns us about adding to the scriptures. If the Bible is silent on our precious Savior as a child until age 12 then we should be silent as well. I certainly won't be seeing this movie. And i thank you for telling the truth.